A performance by the Holot Theatre Group, based on real-life experiences, was the latest event of the Red Lounge hosted in WBC on 27th of January. A composition of Asylum seekers and Israelis, who initially started working in the Holot Detention Camp in the Negev Desert presented the challenges caused by the policy of the government toward refugees and asylum seekers in Israel. “Nesamama”, meaning “One Love” inspired the message of the play – for people to live all together in harmony. 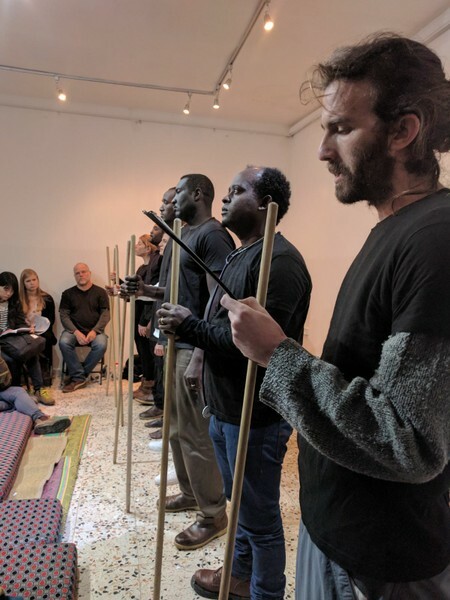 The actors and actresses were singing in Eritrean, while sitting in a row, holding flags of the aligned countries and of Israel, the destination country. Seven people, out of the initial group of twenty one, presented personal testimonies of the participants, forced to leave their former home. During the play, characters shifted between the performers, at times they were in the position of the powerful, and at others in the role of the newcomer, which here unfortunately was the obedient. This constant switching showed the arbitrariness of the system on which the individual is dependent. 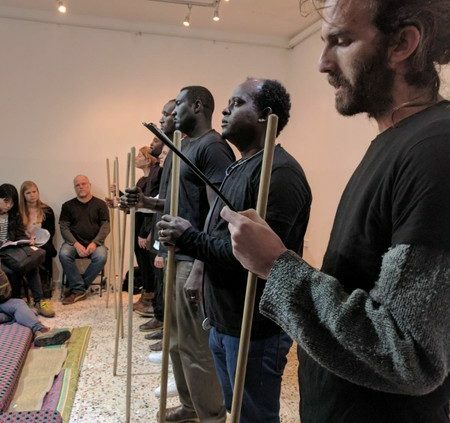 During the past year, the participants of Holot Theatre have explored various techniques, exercises, and improvisations, inspired by Augusto Boal’s “Theatre of the Oppressed,” in order to process personal and social problems of asylum seekers in Israel. This constellation provides a democratic framework whereby legal issues can be critically examined and discussed with the audience, who is invited to actively imagine the possibility of policy and legal change toward asylum seekers in Israel. The audience was then asked which scene they would like to interfere in to achieve another result. By slipping into the role of one of the participants, individuals in the audience were invited to transform these situations. They replayed the challenging crossing of the border between Sinai and Israel, where they were postponed and sent to the visa department and the discussion with the manager at a pastry factory, where they were asking to be allowed to visit their own wife giving birth at hospital. Uncovering these personal stories, and giving individuals the chance to empathise with different situations and individuals, the group aims to inspire public discussion and social transformation, which may ultimately result in governmental transformation.